Lambie Heating and Air Conditioning, Inc was started by Pete Lambie in 1962 when he realized a need for a heating and air conditioning company in Peoria, IL that focused strictly on residential repairs and installs. He started the family business in a small shop on the South Side of Peoria until 1976 when he moved his shop to the Spring Bay area. In 1984, his youngest son, Rob, took over the family business and decided a few years later to move it back to Peoria to its present location. In 2014, Rob’s daughter, Robin, partnered with Rob. 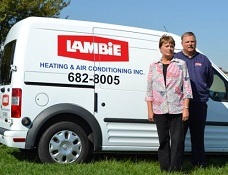 Working side-by-side, Rob and Robin continue the Lambie legacy, Lambie Heating and Air Conditioning, Inc. Since its humble beginnings, the Lambie family has prided itself on providing quality workmanship with a personal touch. With over 50 years of experience, the Lambie family has become an expert in solving all your heating, cooling, and indoor air quality service and repair needs. In 2007, Lambie Heating & Air Conditioning, Inc teamed up with Carrier so that not only can we provide you the best service, but also the best line of heating, cooling, and indoor air quality products on the market for the best price. Put Lambie’s 50 plus years of experience to work for you.